Meanwhile, Shika had decided to use her trainer as a seat, and was purring and in desiration of pets. "Shiks- You can't- we have Pokemon to save!" The Liepard gave a sad look. "Okay, fine. CUddles decided to join in, cuddle time! I need Ghost Gems! PM me please! Luna glanced over at the girl with the Malamar, tilting her head. She had a bad feeling about the situation at hand. Hopefully their numbers would be able to withstand whatever was coming. ((24 hr Time Skip)) "THANK YOU FOR JOINING US HERE AT KANYONIAN CRUISES. PLEASE EXIT SINGLE-FILE. WE ARE ARRIVING IN PALLET TOWN OF KANTO." An announcement is made on all ships as they dock and begin to unboard. Luna exited the ship as quickly as possible. She packed up her Pokemon before they docked, so it was pretty easy for her to get off quickly. After unboarding, the young woman briskly headed to Professor Oak's lab. She felt that this would be a hot spot for all the victims of the island to flock to and she needed to speak with him personally. Levi woke up to the announcement, realizing he had fallen asleep outside the Pokemon center. Disoriented and exhausted, he stood up and slowly stretched. There seemed to be a big group of trainers nearby waiting to unboard. The young man casually walked up to a random person on the outer edge of the group. "Hey, can we finally leave?" N got off, still gloomy over how he had lost Zoroark. He felt.. odd. He felt like the evil-type, for some reason. He shook his head, no, that wasn't him. Natural Gropius Harmonia doesn't do bad things on purpose with knowing their intent. He wanted food, a tad bit peckish. He grabbed some berries off a bush and popped them into his mouth, praying they weren't posionus. As for Alex, she felt the need to set the entire woods on fire, but instead ate some rather bitter berries, avodiing the sweets. The Samurott, Liepard and Audino all exchanged glances. Petal She looked up at hearing someone talking to her. "Huh? Sorry, I got distracted by something. Could you repeat the question?" 'Something' in this case had been an odd feeling she couldn't quite place, but it didn't bother her enough to think much of it. Maybe it was just seasickness or something. 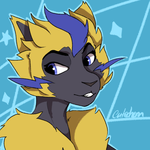 Hey Pokefarm Q. It’s good to be back Avatar is by Cutechem Come visit my art shop! Levi cleared his throat, blushing slightly from embarrassment. "Uh.. do you know what's going on with us? Can we leave?" He repeated, clearly uncomfortable. Kanto was quiet. Oak's lab was visible from port, as well as the new dock. There were a few small houses and a Mart as well.